Welcome to the RWAF’s A Hutch is Not Enough page for retailers and manufacturers. The pet retail trade pays a large part in achieving our key aim, to improve the lives of domestic rabbits in the UK and we’re delighted to work with any retailer or manufacturer who puts the welfare of the animals at the heart of their business model. This page outlines what our campaign is about, and how retailers of rabbits and rabbit accessories can benefit from working with us and creating the best possible environment for rabbits. Our primary focus is on rabbit accommodation as it forms an important basis for the rest of a rabbit’s needs. Countless rabbits spend their lives in tiny hutches, alone and without the ability to display their natural behaviours. Only if a rabbit is housed with enough space, can the rest of its needs start to be addressed. What are we asking retailers to do? Not to stock any hutches smaller than 5′ x 2′ x 2′. To include hutches measuring at least 6′ x 2′ x 2′ in your range. 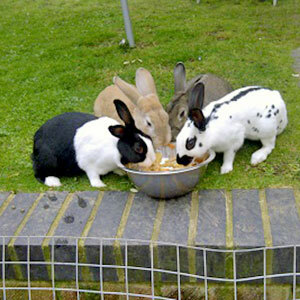 To stress to all customers the importance of exercise and therefore an attached run for their rabbits. Even with a large hutch, rabbits need daily exercise in a run. To include our ‘A Hutch is Not Enough’ leaflet with every rabbit related sale (which will be provided free of charge). Inclusion on our website, in our quarterly magazine Rabbiting On and on our Facebook page – making your outlet visible to thousands of rabbit enthusiasts. A reputation as an ethical retailer. Long term economic benefits of attracting ‘customers for life’ and increased cross sales (see Why Welfare is Good Business below). Online retailers: You’ll also get a banner for your website linking to a mini-site explaining to your customers why they should buy a large hutch, a large run, toys and good quality food and hay. Sign up to our Retailer charter or email hq@rabbitwelfare.co.uk if you have any questions or suggestions. We believe that there are convincing economic arguments that good welfare makes great business sense for retailers and manufacturers. The RWAF would like to see all rabbits kept in neutered pairs, regularly health checked by a rabbit-savvy vet and vaccinated, on a good quality diet with unlimited access to hay, living in spacious accommodation and with access to a permanent exercise area. So surely we share common goals with pet retailers, as this would mean happy rabbits living a healthy life for 8-10 years, providing lots of repeat business throughout the duration of their life. Promoting these guidelines will be good for rabbit welfare and great for business. Over 40% of rabbits bought as an impulse purchase are abandoned in a rescue within 6 months of sale, these impulse purchasers are not long term customers. Owners who are committed to keeping their pair of rabbits happy for life will consistently buy good quality feed and hay, bedding (bigger hutches take more bedding), treats and toys for the run. Pet retailers are often the only source of information for owners and therefore they play an extremely valuable role in educating people on their responsibilities. Help us prevent the all too common cases of neglect – caused mostly by ignorance – reported by rescues and on the RWAF helpline every day. At the point of sale, it’s crucial to provide the customer with some information to take away with them. The Pet Care Trust of course has its own information sheets which can be personalised, and we have our great A Hutch is Not Enough leaflets, On The Hop booklets and further informative leaflets available which we would be happy to supply to retailers. The above shows what good financial sense it is to consider Welfare as part of your business as a retailer. The first step towards this is to sign up to our Retailer charter on hutch sizes. Sign up to our Retailer Charter or email hq@rabbitwelfare.co.uk if you have any questions or suggestions.